I think of myself as a pretty open book with the people I know and love. I don't really hesitate to share personal stories with friends. It has come to my attention recently that in spite of this self-image the truth is I'm really pretty private, at least in the social networking forum of the internet. I'm open, but I guess I'm choosey about who I'm really open with. The problem is that all of my stories are also someone else's story as well and I'm not always comfortable sharing their lives. My recent post about my years as Santa was more personal, but it was seasonally appropriate and hopefully spoke to some universal experiences. But even then I asked permission from my friend Dar and my Godkids before mentioning them in such a public way. I don't often get caught up in nostalgia. Most of the reminiscing I've done here was in service of talking about my history in comics and writing. That's about to change. What follows is a story I've told many people over the years. It's a nostalgic reminiscence filled with the glory of youth. If you have a low tolerance for maudlin sentimentality you might want to bail now. 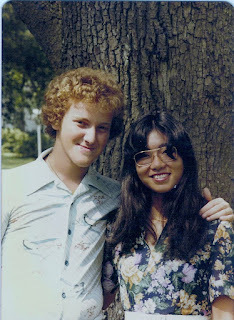 I graduated high school on Sunday, June 10, 1979. 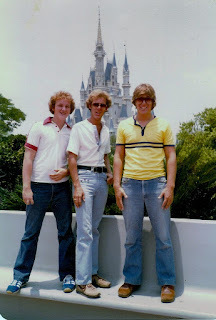 As a graduation present to myself I took a vacation in Florida right after to visit Scott and Mark, brothers who were two of my closest friends at the time. middle and Mark on his left. 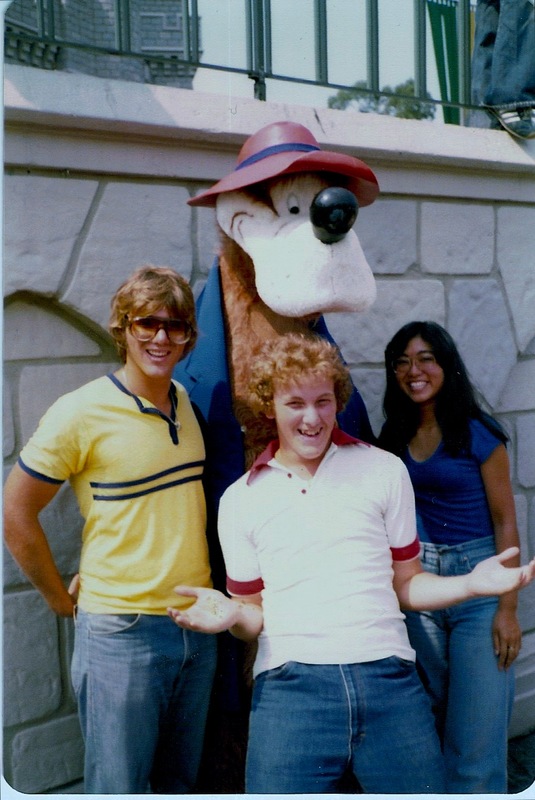 They had moved from southwestern PA the previous year, severely interrupting the teenage adventures we had been having up to that point (some of which I would tell some friends about, but many are not for public consumption). 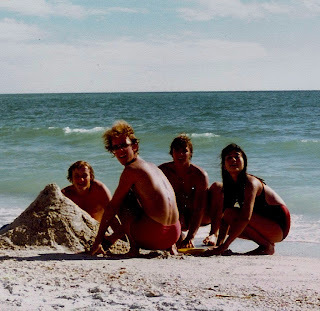 Originally they had planned to drive to PA that summer to visit and then I was going to go back to Florida with them later in the summer. We switched the plans around when we discovered that the rock band KISS was kicking off a tour in support of their album Dynasty in Lakeland, just up the road from where my friends lived. Now KISS was a huge part of my teen years and big part of my friendship with these guys, so on Thursday, June 14 I flew for the first time and landed in Tampa for my first real trip away from home. Anyway, I arrived in Bartow, Florida expecting a great concert, time at a beach, Disney World, going out to bars (I was going to turn 18 while I was there, and guess what the legal drinking age in Florida was at that time), and all kinds of other fun summer activities for young men with no responsibilities. We did all of that, and it was great. But something more important took place for me over the course of those three weeks. I want to tell you about a girl. Chiharu Takahashi was a Japanese foreign exchange student going to college in Florida. Her host family included the minister at the church my friends went to in Bartow, where she had met them. They had told me a little about her of course, and I knew she would be hanging out with us some. We went to the minister's house on June 15 to pick her up so she could go to see KISS with us. This was going to be her first concert (I was a veteran at this time with three big shows under my belt, KISS and Ted Nugent in '78 and Rush earlier in '79). We walked into the house and I was introduced to the minister and his wife. And then I turned and saw Chiharu. At my current age I realize the whole “love at first sight” thing is a Romantic ideal and rarely holds up to the rigors of a genuine relationship. Whatever. At that moment I was smitten. Knocked over. Stunned. Completely in love in the way only a seventeen year old dreamer like myself can be. She was beautiful! Though accented, her English was very good. She was really smart and had a great sense of humor and fit in really well with the three of us. Surprisingly, I wasn't a tongue-tied buffoon in her presence. We crammed into the car and went to the show. Now, we all know I'm a comic book geek. That's not only how I organize my life, it's what people expect of me. So this next shouldn't be a surprise. 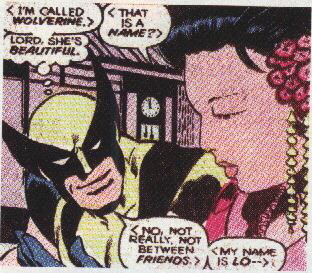 The previous winter in the pages of X-Men #118 (my favorite book at the time), the character Wolverine had met a beautiful Japanese woman named Mariko Yoshida. The coincidence of this with what was happening in my own life was not lost on me at the time. Chiharu or I were wearing costumes. Back to real life... I don't think I saw her every day, but we spent a lot of time together, always the four of us. Chiharu and I didn't get a chance to “date” in any regular way. She was one of the guys. But like I said, I was smitten, and I thought, in my inexperienced way, that she liked me too. You know... Liked me liked me. That Sunday we went to the beach and I saw the ocean for the first time. Well, the Gulf of Mexico actually, but it was still pretty darn impressive to this country boy. We swam, we played in the sand, we ate, we drank enough wine that I fell asleep in the sun and burned my pasty pale skin really badly. This was before my skin got baked. Oh yeah... tell me she's not checking out my rock-hard abs. South isn't shown any more. We went to Disney World and rode all of the rides and ate all of the food and saw Mice and Princesses, Presidents and Country Bears, Tiki Birds and singing little people. It was a remarkably full day, but two events stand out; two that convinced me that Chiharu Liked me liked me. We went on Space Mountain, a giant roller coaster in the dark. Chiharu had never been on a coaster before, so she was excited and scared. We paired off and she rode with me. At the time (maybe still...I haven't been there in ages), the seats were arranged so that one person sat in the rear of a car and the second person sat directly in front of and leaned back against the first. So I sat down and then Chiharu planted herself between my knees and leaned back. We had hugged by this time, but this was the most intimate position we had experienced yet. We weren't up the first rise before she started whimpering. Then we dropped over the first fall. Gravity and inertia pressed her against me. Her head leaned back on my shoulder and all I could hear were her tiny sighs and squeaks of fear and excitement. Best roller coaster ride ever. The other event of the day that stands out took place as we were leaving the park. It was really late and we were among the last people to leave, squeezing the most out of our day. We were walking through the courtyard of Cinderella's Castle. It was night, so the castle was lit with magnificent color. Music played from hidden speakers. I don't remember the song, but it was an instrumental piece from one of their films. As we were walking along I stopped, took Chiharu by the hand and asked her to dance. We slow danced around the courtyard until the end of the song, bowed to each other when it was over, hugged and then broke out into laughter as we all made our way back to the car and the real world. It was one of the most spontaneously romantic moments of my life. Eventually I left Florida. 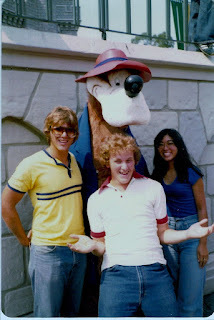 Scott, Mark and I drove back to PA, my first extended road trip. My last day there was a Sunday. We went to church and there, after the service we took pictures and I said goodbye to Chiharu. She cried. Pretty sure I wanted to. She gave me a going away present. 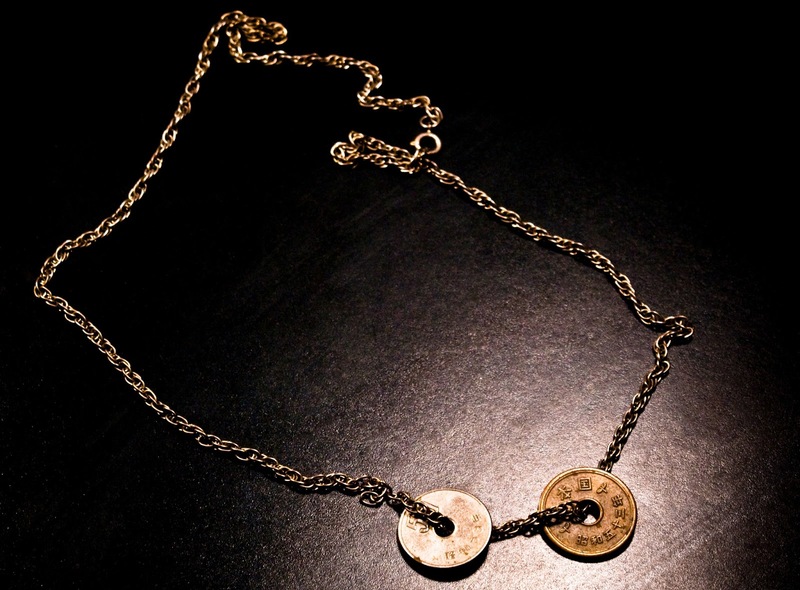 She had placed two Japanese coins on a chain for me to wear to remind me of her. I wore them for years. We stayed in touch. We wrote letters. We actually wrote a lot of letters. Occasionally we called each other for short talks. Long Distance phone calls were expensive in those days. the trip to see me. We all hung out one single afternoon, had a great time and took some pictures. Then she was gone. Two years went by. We still wrote regularly. She started seeing some guy in Tallahassee. I had my first serious relationship (and though that romance didn't last a year I'm happy to say I maintain a good friendship with that beautiful, wonderful woman. She commented on a picture of me on Facebook while I was writing this). I turned 21 in the summer of 1982 and returned to Florida for what would prove to be my last visit there. My friend Peggy and I went to a three day comic book convention in Pittsburgh then on Monday flew to Florida for ten days. These were two of the best and weirdest weeks of my life, filled with many of the stories I tell most often (most of which I'll never relate online, for the protection of the not-so-innocent... we nearly sank a boat). As sort of a comic book bookend to this story, this was the year the first Wolverine mini-series came out. Set in Japan. Dealing with his relationship with Mariko. We read the concluding issue while we were there. Once again, the coincidence with my life did not escape me. I had made arrangements to see Chiharu during the trip. 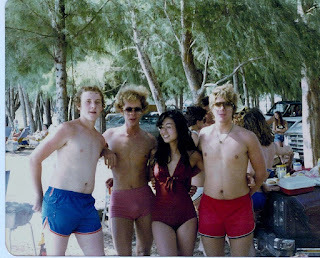 Peggy served as wingman for me and convinced Scott and Mark to let me have a night with Chiharu alone. She picked me up in her car for what I guess was a date. We went to see E.T. By the end of the movie I heard her crying. 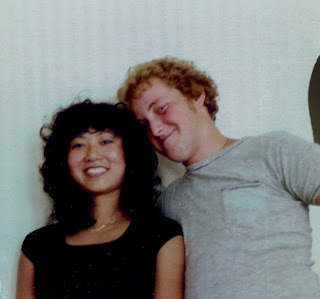 I tentatively put an arm around her (remember, we had never, in all of our correspondence, mentioned anything about a relationship between us. There were simply too many miles for that to happen). To my relief she crumbled into me and let me hold her until the end of the movie. We left and went someplace for dinner, Pizza Hut if memory serves. We drove back to Scott and Mark's house. They were still out with Peggy and some other friends but their parents were home and apparently in bed. We sat in the car and talked. About many things. During this chat she told me about some of the terrible things her boyfriend had done to her. Abusive things. She cried again, embarrassed but relieved to tell someone. She wanted to break up with him but was afraid. I was livid. I sat there in the dark, not knowing what to say or do, feeling helpless and angry and very, very much in love. It may not have been appropriate, it might not have been what she needed to hear right then, but in that moment, with everything extreme I was feeling, I had to say something. So I did. I held her then. Nothing more. We didn't even speak. At some point my friends came home. They had been partying and were a little wound up. Scott came to our car and started telling us about all the great stuff they had gotten into. Peggy once again saved me. She took Scott by the arm and led him away from the car. We stayed there for a little while longer, but finally I realized I needed to go. I said good night and as I started to open the door she leaned over and kissed me. It was short, but it was real. I got out and waved as she drove away. We stayed in touch, letters and phone calls. She broke up with the abusive douchebag. Eventually she finished school and moved back to Japan. She ended up teaching English to grade school kids, last I heard. We continued to write for several years. But that eventually dwindled and then stopped. I don't know which of us wrote last. I've tried to find her during the internet age of course. But the name Chiharu Takahashi is apparently a lot like the name John Smith because I've seen dozens of listings for men and women with that name over the years and none of them seem to be her. So what do I make of this, thirty-plus years on? Was she the great lost love of my life? Probably not. We never had the chance to have a relationship. It was an idealized long-distance not-quite-romance that existed in my head more than anywhere else. I have no idea if we would have been compatible over the long haul. What it was for me though was a beautiful experience that has given me wonderful memories and great stories. 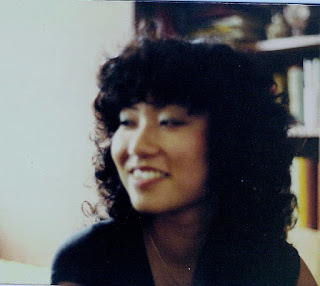 It may be better that she remains an ideal romance of my youth, unsullied by real life. But in my interaction with her, through our brief moments together and in the many, many words of our correspondence, I opened up to another person. I began to transition from a youth to an adult. I think whatever it was I felt for her helped prepare me for real relationships with real people. Since then I know I have had the genuine love of a woman, real and sullied instead of ideal and pristine. More difficult, but more rewarding. 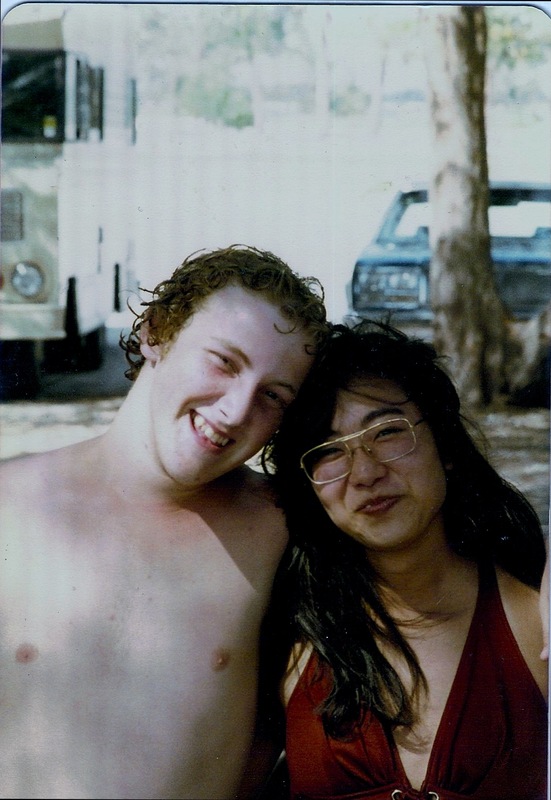 Chiharu, if you're out there, know my twenty-one year old self believed he loved you as much as he was capable of loving. Somewhere inside of me he still does. Thank you for returning my affection. Thank you for being in my life and for giving me a story. 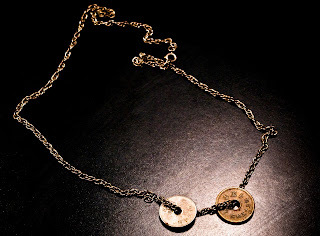 I still have your necklace. I still think of you. I hope your life has been wonderful and filled with love and adventure and fulfillment. Domo Arigato.